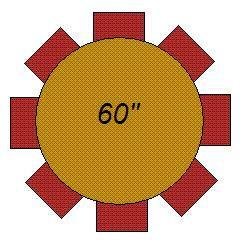 90" or 104" Round for lap length linen. 120" Round for floor length linen. * Please call us with any questions about our table round 60 inch rentals in Sedona, Cottonwood, Camp Verde, Prescott Valley, Chino Valley and surrounding metro areas.